BEIJING - Authorities in the Xinjiang Uygur autonomous region have unveiled a package of measures, ranging from safer housing to better education and wider social security coverage, to improve local residents' livelihoods. The package was decided at a regional work conference and came after the central government outlined earlier this month a strategic plan to ensure "leapfrog development and lasting stability" in Xinjiang. The leapfrog economic development of Xinjiang is the regional government's top priority, newly appointed regional Party chief Zhang Chunxian said at the two-day meeting that ended on Thursday. "Poor economic structure, lack of capital, infrastructure and skills, as well as social instability, all hinder the region's development," Zhang said. 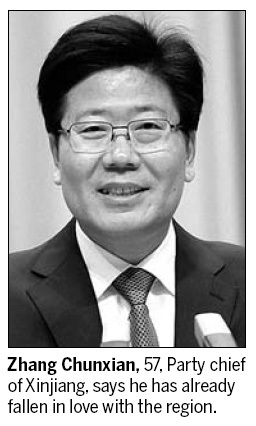 Zhang, 57, replaced former Party chief Wang Lequan late last month. Wang led the region for nearly two decades. The regional government will focus on developing relatively poor areas in south Xinjiang, where there is a large population of the Uygur ethnic minority, by providing special aid, Zhang said. Moving 700,000 urban families to safer and earthquake-resistant houses by 2015 and settling down 100,000 herdsmen in the region. Shantytowns are expected to disappear from cities in five years. Promoting bilingual education (Chinese and minority languages) at all schools by 2015, especially those in the southern part of Xinjiang, so that all students can speak fluent Mandarin by 2020. Identifying jobless families and helping a member of the affected family find a job within 24 hours. Having all elderly people in rural areas covered by social pension insurance by 2012. Raising Xinjiang residents' income through economic reforms and helping people find jobs, as well as raising government workers' wages at appropriate times. Zhang said Xinjiang, which neighbors eight countries including Afghanistan, Kazakhstan and Pakistan, will further open up to make the region a major gateway and base to the outside world. Similarly, Xinjiang will better utilize international and domestic resources and markets, introduce investments from abroad and act as a bridge between foreign and domestic resources. After his two-hour speech on the development of the region, Zhang also took the opportunity to say something "from the bottom of my heart" - a rare gesture among high-level officials on such occasions. Zhang said he joined the People's Liberation Army 40 years ago and his dream was to die on the battlefield in serving the country. But improving people's well-being and helping the country become more prosperous is the ultimate goal as a Party member, a transcript released on the official tianshannet.com.cn cited him as saying. "It has only been a month since I became the Party chief of Xinjiang, but I've already fallen in love with this beautiful place," Zhang said. "I really want to be a son of Xinjiang." Xinjiang netizens expressed high hopes for their new Party chief, who was referred to as the "Internet secretary" during his tenure as the Party chief of Hunan province because of the importance he placed on online public opinion. "I was touched when Zhang said he wanted to be a son of Xinjiang. I believe he can change Xinjiang even though he is faced with many challenges," one netizen posted on tianshannet.com.cn. Three weeks after Zhang started his new job, the regional government announced that it was lifting a regional ban on Internet access. The ban was imposed one day after last year's July 5 riot, which left 197 dead and 1,700 injured in the region.